Situation: You can hit the target ball, but there is no clear path to pocket it. 2) hides the object ball behind another object ball. In either case, you are forcing your opponent to kick the cue ball to hit the target object ball. Common Dangers to Avoid Include: Not visualizing the finished safety play (where you want the balls to land). Lingering over your frustration that you can’t pocket the ball instead of getting mentally focused that you’re playing a safety shot. Anyone of these slip-ups can leave your opponent with a makeable safety shot of their own. 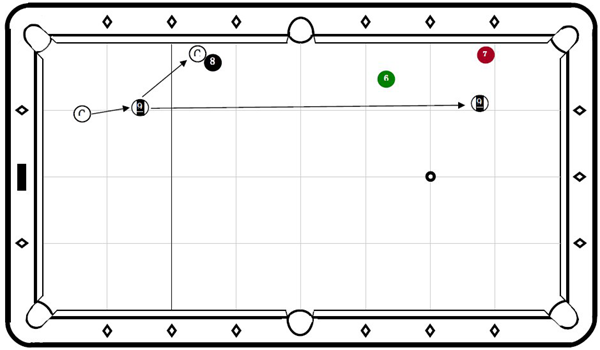 After striking the target object ball, use Follow (Top) English and cause the cue ball to roll up directly behind (preferably touching) the object ball that will eclipse the cue ball from the target ball. During practice, vary the distance, in half diamond increments, that the cue ball must roll to kiss up to the eclipsing object ball. The closer the cue ball lands to kissing their eclipsing object ball the more difficult it will be for your opponent to hit the target ball. Remember, It is not required that you make a ball every time you are shooting to win a game. It is more important that you maintain control of the game and in many cases of your opponent by not taking wild chances at making a ball when you can play a safe and in many cases come back to the table with ball in hand. Defense should be an equal and balanced part of your whole game and not a default for when you don't see an open shot. Sometimes playing a safe while you have an open shot is the better choice. The open shot may be a pocket you want to keep blocked which prevents you opponent from making a ball in that corner pocket. Attend a Boot Camp Intensive Pool School for Complete Defensive Playing Skills. Day 2 of BCI covers Kicking Systems, Banking Techniques, Executing Defensive Shots and more. Click here for the schedule and get registered! I have watched the promo video on the B.R.A.C several times but still have not been able to understand it.